Seth Schott writes and runs OTR Matters, a blog centered on the historic Over-the-Rhine neighborhood in Cincinnati. For more OTR-centric musings, check out the Over-the-Rhine blog, as well as OTR Matters on Facebook and Twitter. Yesterday, OTR-resident and blogger CityKin wrote a post about 1314 Vine Street titled “Does this building stay or go“. The thoughts and its comments are an informative read and a good introduction to the subject of this post. The time is now to discuss the fate of 1314 Vine Street and the current design of the planned Mercer Commons development by the public-private Cincinnati Center City Development Corporation (3CDC) in the Gateway Quarter. Mercer Commons is a planned development of new construction urban infill and historic restorations in the area surrounding Mercer Street in Over-the-Rhine. The development is bounded by Vine Street to the west, Walnut Street to the east, 14th Street to the north and the northern half of the 1300 blocks of Vine and Walnut Streets. It is an exciting opportunity to turn another corner (excuse the cliché) in OTR’s revitalization. 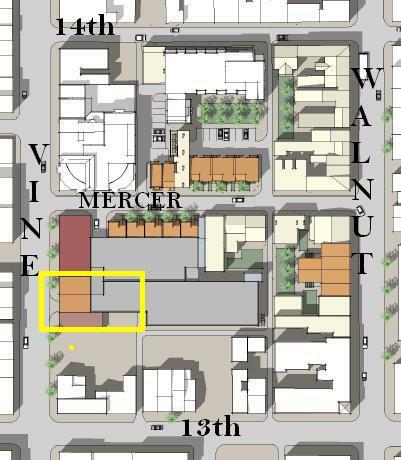 In the footprint rendering above, one can see the position of 1314 Vine Street highlighted by the yellow square. If you look closely, you can see the driveway entrance to the parking garage (gray boxes in the middle of that block) lines up directly with 1314 Vine Street. Mercer Commons looking east with Vine Street in foreground. Fate of 1314 Vine Street unknown. It appears that 3CDC is not planning to save 1314 Vine Street, despite that the building has a historic facade and unique and beautiful stone cornice. According to the Hamilton County Auditor’s website, 1314 Vine St. was built in 1880 though the date is probably a best guess. The property was transferred from Cincinnati Public Schools to OTR Holdings Inc, a subsidiary of 3CDC, on August 11, 2008. It is a two story structure with what appears to be a cast iron storefront and a beautiful cornice. The original brick exterior has been covered in Dryvit or stucco and painted an odious shade of mauve, which apparently manifested itself during the structures days as a dance club in the recent past. The current configuration of front windows is not original as will be explained later with an examination of the 1904 Sanborn insurance maps. The peaked roof is topped by raised glass skylights that run the length of the building, see image from Bing Maps below. 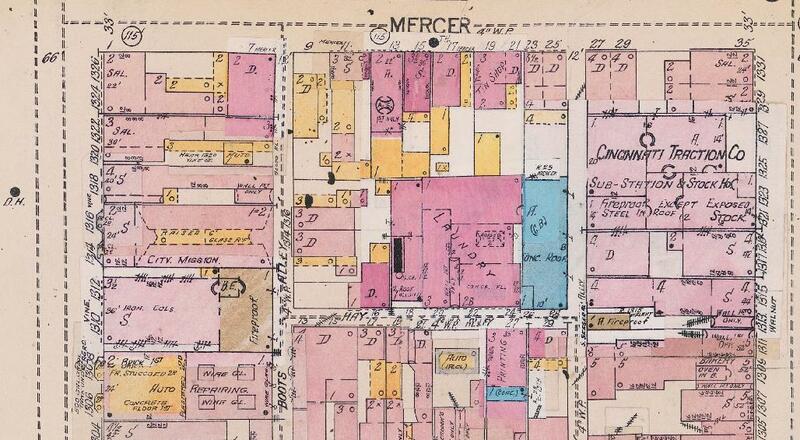 In the last Sanborn Map image, you can see the bay windows on the front of the building facing Vine Street. 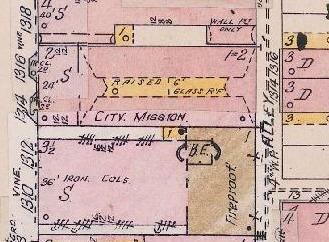 The inclusion of the “CITY MISSION” label is puzzling, but may point some ardent historian toward another chapter of this building’s history. In 1919, volume 31 of The Machinists’ Monthly Journal, Official Organ of the International Association of Machinists shows 1314 Vine Street as the “District Lodge of the Grand Lodge of the International Association of Machinists”. There are two issues at play in the fate of 1314 Vine Street. The first is the fate of the building itself at 1314 Vine Street. The second issue is larger and concerns the role historic preservation plays in the redevelopment of Over-the-Rhine. How important is each stitch in OTR’s historic fabric? It’d be enlightening to hear the opinions on these issues from 3CDC, the Over-the-Rhine Foundation, the Cincinnati Preservation Association, individual citizens, and others. 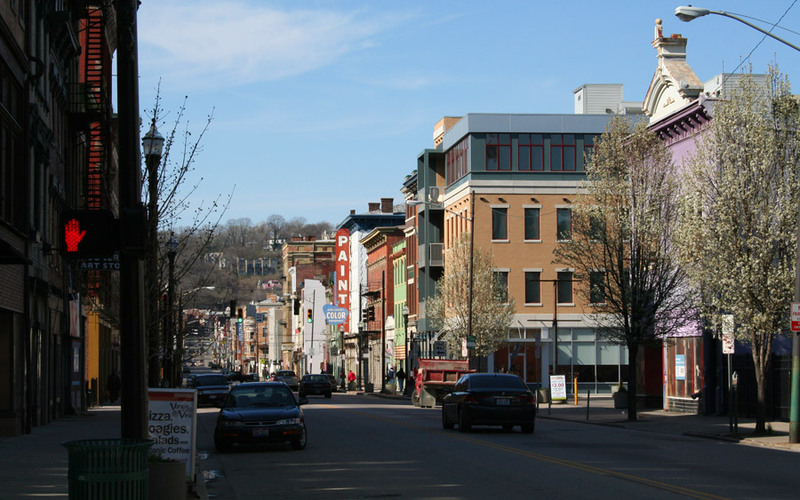 3CDC is to be lauded for its successes, and Mercer Commons could be a true triumph for OTR. However, if 3CDC chooses to demolish 1314 Vine Street by way of a “special exemption“, it will become in no small measure, but a part of the problem it purportedly seeks to remedy. 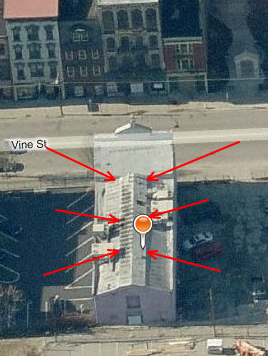 Determining the fate of 1314 Vine Street would be better addressed sooner rather than later. Editor’s note: The Enquirer posted an article delving into more detail about the project, which is an interesting read. There seem to be two sides to the argument: one – every historic building is worth saving, and as much as possible should be done to preserve the fabric, no matter the cost. two – sometimes sacrifices need to be made. 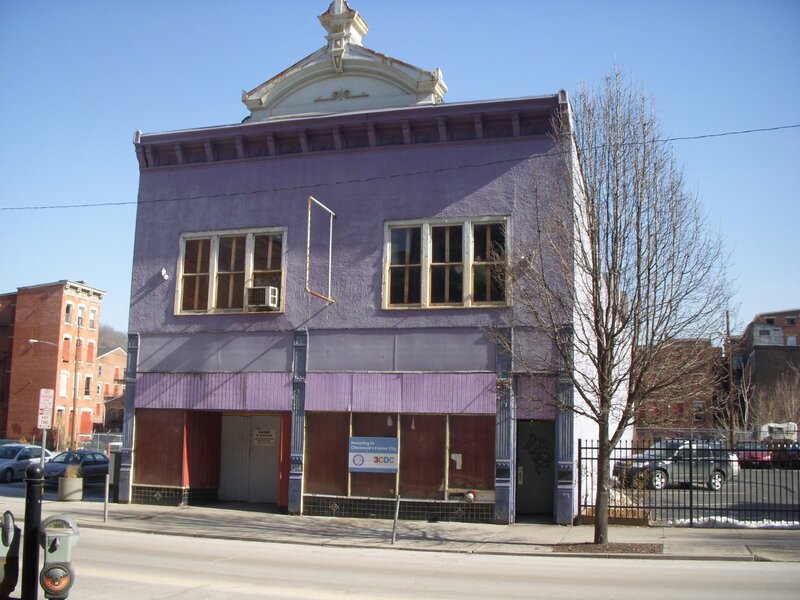 The National Historic Registry has been contacted – I’m interested in finding out exactly what it means for OTR’s historic registry status with continued property demolitions and whether or not more demolitions truly threaten the status. Will update with more information as it is received. 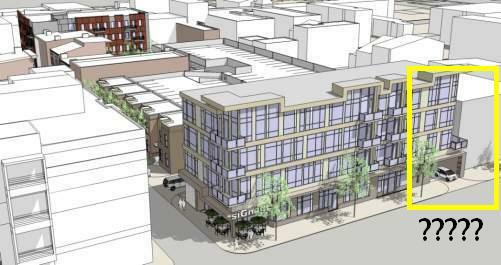 So, Mercer Commons: an unacceptable demolition or a necessary evil for the greater good of the neighborhood? We welcome your thoughts. Next articleWould carpool incentives be cheaper than a new Brent Spence Bridge?